This is an Oyo Sports Toy Mini Figure & comes new in package (NIP). Search our store for many other NFL Oyo figures. Oyo Figures measure almost 1 3/4" tall. Each package includes the player, football, helmet and facemask, water bottle, football cap, rectangular stand, and a unique OYO DNA number. Collect your favorite players and your favorite teams. MORE INFO ABOUT OYO'S: Compatability: OYOs play nicely with other toys! OYOs are compatible with other name brand building blocks, so your OYOs can become part of your favorite scene. We encourage you to build and play! Facial Likeness: OYOs are designed with eyes, ears, nose, mouth, and other facial characteristics that best represent their real life counterparts! OYO DNA #: Printed right on the stand is your OYO's very own unique DNA number. This number can be used to identify your OYO. Unique ball design snaps onto hand and allows your OYO to grip and throw. Cool down with the attached water bottle after making the great play. Rotating Forearms: Specially designed for sports figures to allow for action! Bending Knees: Without knees that bend, you walk like a mummy! Additional joint allows OYO to run, sit, squat, and wind-up. Stand: Each OYO comes with their own stand, which lets you position and pose your OYO for display on any flat surface. Or, snap your stand onto a building block grid and build your own scenes! This is an Oyo Sports Toy Mini Figure & comes new in package (NIP). NCAA Oyo Mini-figures new for 2013. Oyo Figures measure almost 1 3/4" tall. 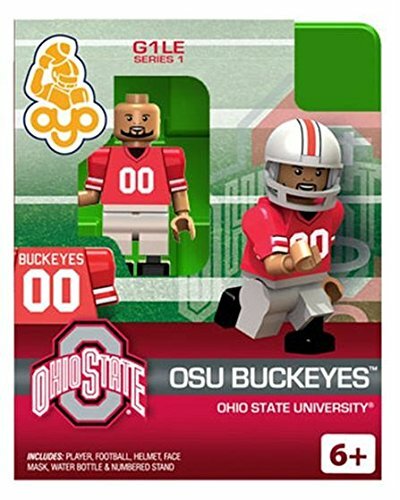 Each package includes the player, football, helmet and facemask, water bottle, football cap, rectangular stand, and a unique OYO DNA number. If you have any questions about this product by Oyo Sportstoys, contact us by completing and submitting the form below. If you are looking for a specif part number, please include it with your message.